I haven’t yet posted about my christmas break craftiness because there is so much to report that it is a bit overwhelming. But i figure I’ll break it up into a few pieces and it’ll be okay. 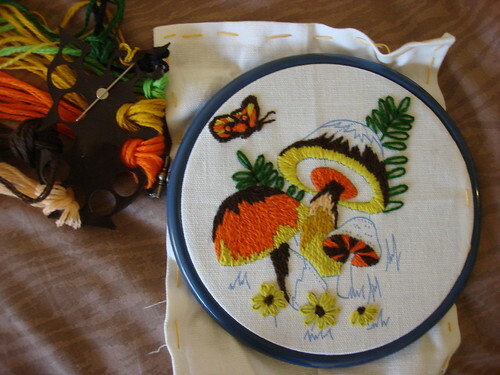 Let’s see… where to start… “Start a vintage Crewel project” was the big loser in my poll, gathering only 1 vote. Let’s start there because not only did I start a project, I finished it! Take that voters! As a wee crafter, I spent many a holiday working on little holiday needlepoint and cross-stitch patterns that my mom hoarded during after-christmas sales. The first step (and the one that drove me INSANE when I was young) is to baste the edges of the canvas to prevent fraying. I dreaded doing it, but it was not nearly as tedious as I remember (can I possibly be more patient than when I was 8?). The next step was always to take of the thread from the project and attach to a yarn organizer. Miner were always butterfly shaped. Did anyone ever have one that WASN”T a butterfly? Anyway, i realized that this would be the step to stop adult-me in my tracks. I didn’t have a yarn organizer. With nothing to do all day but craft, and an awesome idea from Carmen, i decided to make my own. 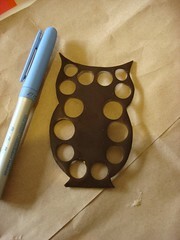 i whipped out a sheet of Brown shrinky-dink plastic and threw together a retro-fabulous sketch of an owl. 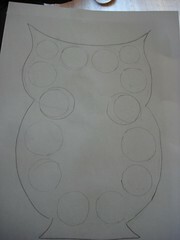 I planned out where to place holes that I could punch with my circular craft punches. Then I popped it into the toaster oven at 300 until it shrank up (i used chopsticks to pull apart any areas that got stuck during shrinking). I am really pleased with the holes of varying size – it is very satisfying to put the fat wads of yarn in the bigger holes, and the thread in the tiny holes. I added a rare earth magnet (with E6000 glue) to the center to hold on to needles, and then I got busy! So busy, in fact, that I completed the whole thing! 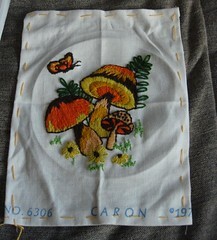 The project was a new in package 1972 Caron Crewel 5 x 7 (#6306). The yarn was all wool (in some of the older projects the included yarn is acrylic) and the instructions were thorough. Highly recommended! 10 Responses to "Crewel for christmas"
Your owl thread organiser is so clever – I love finding new uses for shrinkydinks! Very clever on the yarn organizer front. I firmly believe that brown, orange and gold (and olive/army green) were the official colors of the 70s. The crewel is lover-ley! 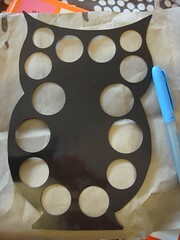 But, the shrinky owl yarn organizer??? Genius!!!! You continue to be one of my crafty heroes! Can\’t wait to see more! I wish that Owl were a needle gauge. It\’s totally cute! I don\’t know anything about yarn thread organizers. Seeing as how I just got a sewing machine, maybe I should learn. It’s so cute and beautiful! You never cease to amaze me with your innovation-awesomeness! I love the owl, what a great idea! Plus, I’m new to embroidery and your pieces are great! Makes me want to get out my needle and thread even this late. Love my owl organizer! I say it over and over, but you’re so damned clever.